Opens up whole new plots and opportunities - amazing! This installment of the Mythic Magic-series clocks in at 26 pages, 1 page front cover, 1 page editorial, 1 page SRD, 1 page ToC, 2 pages of introduction, 1 page advertisement, 1 page back cover, leaving us with 18 pages of content, so let’s take a look! Well, I know – it does sound a bit like a contradictio in adjecto – horror and mythic gameplay? Well, once one thinks about it, that seeming contradiction is immediately resolved: After all, when dealing with potent, heroic characters, why not even the playing field with high-powered, mythic villains? At the same time, the corruption of true paragons of virtue and demi-gods can indeed make for an intriguing set-up. 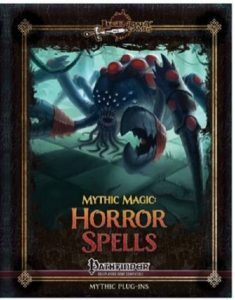 As always in this series, we take a massive hardcover’s spells and add mythic upgrades to the respective spells, so let us survey how the horrific options fare when upgraded to mythic status! After an alphabetical list of the spells covered (handy), we begin with absurdity, which ties in, penalty-wise, with humor-based spells in addition to numerical escalation of penalties etc. – really creative here would be the 4th tier augment, which adds nauseated to the aftermath of fear-based effects that the spell would provide immunity for, which makes for a rather interesting array of options as far as I’m concerned. Alleviate Corruption is a spell, at least in its mythic iteration, that should be welcomed by anyone disliking the implementation of the system, allowing for the removal of manifestations and a 2-stage decrease…oh, and via 6th tier augment and 3 uses of mythic power, you can potentially avoid catching corruptions. There also are mythic upgrades that do not require their sometimes problematic components and we have modifications, for e.g. assume appearance allowing for the assumption of a helpless target’s appearance in a focus modification, with the augment further enhancing this trick – really cool! Not all spells, obviously, are thus enhanced in breadth – ban corruption, for example, simply also suppresses the effects on a successful save as well and it also increases the spell’s duration. Barbed chains can be used for grappling when properly augmented and blood ties eliminates the damage cap of transferred damage, which enhances the spell’s already impressive narrative potential. Nice job there! Contact entity, just fyi, lets you contact more of them and yields a bonus when interacting with them…oh, and at higher tiers, you can mix the eldritch abominations you contact! The curse of fell seasons is vastly expanded (1 mile per tier radius), also enhancing the cool visuals and potent curse-visuals of the base spell…and yes, obviously, this extends to curse of night. And yes, before you’re asking, I’m so making dread lords use mythic spells and abilities. MUAHAHAHA! Sorry, disregard that. The various curse terrain spells all get different entries – beyond control of hazard placement, we get more of them and yes, once again, the radius is vastly enhanced. Using decapitate as a response to a critical threat and get a bonus to confirmation…other than that, we have increased bonus damage and penalized saves for nonmythic creatures – ouch! Decollate ties in with one of my favorite Ravenloft NPCs, allowing for the removal of heads of even unwilling victims. For this upgrade alone, I’d hug this pdf – to anthropomorphize it slightly…oh, and action economy and interaction are presented in clear and concise ways – pretty damn cool! Flickering Lights allow for slightly more control by rolling twice…while green caress amps up the body horror by making it work *a bit* like a plant apotheosis…not fully, but enough to be weird in an uncanny valley way. Impossible Angles increases the chaos of the direction stumbled in a fun manner, while, guess what, mythic massacre really lives up to its name…and the augment makes it conical and adds necromantic energy to the fray. As a minor complaint, that should probably be negative energy damage, not untyped. The various effects for maze of madness and suffering are creative and honestly, can be used for really potent terrain hazards, should you choose so. Phobia‘s upgrade is also devious, providing new and sensible options to the spell. Pure narrative gold: The upgrade of the sacramental seal spell, which now comes with a mighty 10th tier augmentation that allows for at-range maintenance of the seal. “We were all safe while the kind of wizard lived…but now, the darkness has broken free…” It should also be noted that the new types of fear introduced in Horror Adventures have found their respective rules-language. Sleepwalking suggestion, btw., does now allow you to go full-blown Wieland-plot with it! And no, I have not nearly touched upon all of the spells, just tried to provide a nice and varied sampling. Editing and formatting are top-notch, I noticed no significant hiccups in either formal or rules-language criteria. Layout adheres to Legendary Games’ 2-column full-color standard for the series. The artworks should be mostly familiar ones for fans of LG – they are in full-color and mostly fit the content. The pdf comes fully bookmarked for your convenience. Alex Riggs and Jason Nelson deliver one furious, amazing upgrade for the spells in the Horror Adventures hardcover. As always in this series, I am impressed by the work that has went into this book, but more so than by the numerical upgrades and escalations, it is the increase in breadth, the better representation of mighty concepts that made me enjoy this. Much like the installment on Intrigue Spells, this amps up the themes and, in my book, the expanded curses and potent abilities herein just scream for being tied to the dread lords! The creative and concise rules-language delivers and, as a whole, this is not only a good options-book – it is a great book for GMs using Horror Adventures to get more out of the tools they have, to tell different stories. And that is more than most spellbooks can ever hope to accomplish. While there are a few cosmetic nitpicks I could field, ultimately, that would not do the book justice. I consider this an awesome expansion, well worth of a final verdict of 5 stars + seal of approval. You can get these cool upgrades for horror-magic of mythic proportions here on OBS!